One of the sponsors of the event, Québec Metallurgy Centre, is a leader in research and development of aluminum alloys. As part of their research, they have a SonicLayer 4000 machine that was delivered earlier this year. They are focusing their research on dissimilar metal welding to solve industry problems. This weekend Fabrisonic family and friends gathered to celebrate three years of metal 3D printing. 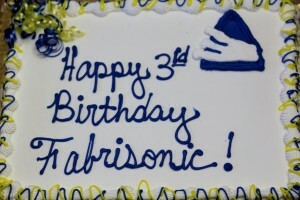 Fabrisonic launched in October of 2011 at a small cafe in downtown Columbus. Over the last three years we have placed machines in three countries and built parts for planes, trains and automobiles. Thanks to all of our customers for your support and vision. We look forward to another exciting three years as we grow the company.